Giant hogweed, an illegal and toxic non-native plant has been known to give state and federal officials heartburn now and then. But homeowners, hunters and hikers who may stumble upon it are being advised to report it and give the plant wide berth so as not get burned themselves. Giant hogweed, or giant cow parsnip as it known, is a member of the carrot family. But it ranks right up with poison ivy and poison sumac as a health hazard, according to the Michigan Invasive Plant Council. The organization first reported about the weed in 2003. The group was formed in 1999 by a federal executive order signed by then President Bill Clinton. Cow parsnips may grow to three or four feet tall, but giant hogweed can get to be 15-feet high with five-foot-wide leaves. It is covered with fine fuzz that carries a toxic sap. The toxic effects are triggered by ultra-violet light, or sunlight. Get the sap on your skin and walk in the sun and a serious case of blisters is likely to follow. Giant hogweed is not a huge Michigan problem according to state and federal officials who track invasive plants. It is a much bigger problem in Pacific Northwest states. Here, there is far more garlic mustard on the ground. But unlike that leafy plant which can be used in cooking, giant hogweed is a serious public health danger. It is listed on the federal noxious weed list which prohibits its possession, sale and transport. “It’s been growing in Michigan for about 50 years,” said Ian Shackleford, a botanist with the Ottawa National Forest in western Upper Peninsula where the largest Michigan infestations are found. 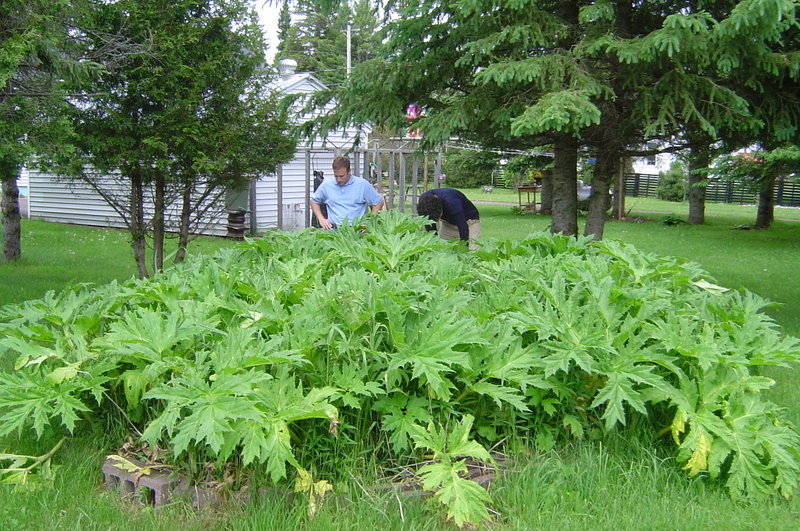 There are 22 Gogebic County sites where giant hogweed has been reported. None are in the Ottawa National Forest, according to Shackleford. Most of those plants have since been eradicated, but eight sites were found and treated in 2012. The plant has been reported at 60 sites statewide, from Detroit to the western Upper Peninsula, according to Michigan Department of Agriculture and Rural Development records. It has appeared in small numbers in several Lower Peninsula counties including Ingham, Berrien, Muskegon and Manistee counties. Agriculture officials said federal money available for eradication dried up in 2012. Michigan was annually spending approximately $10,000 in federal funds to treat giant hogweed sites. “Our funding was eliminated and we have no program anymore,” said Mike Phillip, pest survey program specialist with the Michigan Department of Agriculture and Rural Development. “It’s one we would like to be involved with because of the health hazard, but it’s not in the cards. More information about identifying giant hogweed and who to contact is available online at: Michigan.gov/mdard Click Consumer Information in the left column, then Human Health, then Giant Hogweed. Additional information is available from MSU Extension Service at: msue.anr.msu.edu Type “giant hogweed” into the upper left search box. This entry was posted in Uncategorized and tagged Conservation, Envionment, Giant Hogweed, Invasive Species, Michigan Invasive Plants Council, Nature, Ottawa National Forest. Bookmark the permalink. What do you do if you find it??? Contact the agencies or look up how to remove it safely on the websites listed in the story.